Specially formulated anti-allergen* detergent works on everyday dirt, heavy traffic areas, dust & allergies. 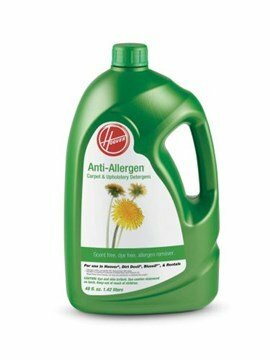 This fragrance-free, dye-free, and allergen*-removing cleaning solution is designed for families that are sensitive to the substances that contribute to allergies. For use on carpets, area rugs, upholstery and car interiors. Formulated for use in all carpet cleaning machines including Hoover®, Dirt Devil®, Bissell®** and Rentals.